Today’s service of Morning Prayer for Christmas Day can be found here. So begins the explanation of Step One of Alcoholics Anonymous in the book Twelve Steps and Twelve Traditions (21). In my own case, the fall was both abrupt and literal — from a successful performance at a client event in the morning to a bruising, drunken fall in front of clients and colleagues on the marble floor of the hotel lobby that evening. The next day I flew home knowing I would be fired, then waited, head in my hands, to tell my wife the news. I had, through my drinking, lost a job I loved and any self-respect and self-confidence I had clung to in the face of growing concerns about my alcohol use. “Once this stark fact is accepted,” says Step One, “our bankruptcy as going human concerns is complete” (21). According to the Christian tradition, humanity generally was pretty much bankrupt and definitely in need of God when God decided to send his Son to live as one of us. That’s the background to the Christmas feast that we celebrate today. 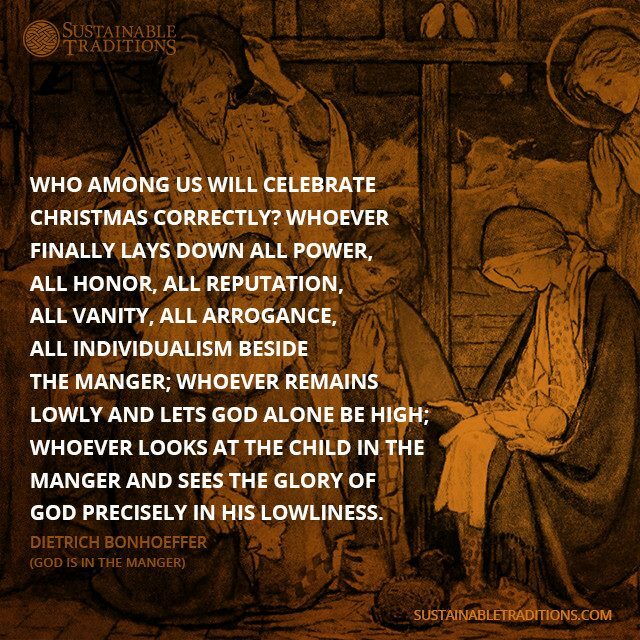 Humility, to Bonhoeffer, means “laying down all power, all honor, all reputation, all vanity, all arrogance, all individualism beside the manger.” It means imitating God by remaining lowly. “The glory of God precisely in his lowliness” is what we see in the manger at Christmas. At Christmas God laid down all power, all honor, all reputation and became a human being, vulnerable just like us. Who are we to be anything but vulnerable like him? This morning we have in Morning Prayer one of the juxtapositions that make the Daily Office such a rich source for reflection. It is Christmas Day, and so in the first of the collects we speak of our gladness and joy and confidence in God. O God, you make us glad by the yearly festival of the birth of your only Son Jesus Christ: Grant that we, who joyfully receive him as our Redeemer, may with sure confidence behold him when he comes to be our Judge; who lives and reigns with you and the Holy Spirit, one God, now and for ever. Amen. Almighty God, whose most dear Son went not up to joy but first he suffered pain, and entered not into glory before he was crucified: Mercifully grant that we, walking in the way of the cross, may find it none other than the way of life and peace; through Jesus Christ our Lord. Amen. Humility is not a one-time admission that we get over and done with. Rather, it is an acceptance of our proper place in relationship to God and to other people, who may also be powerless, whose lives may also be unmanageable. We do not remain bankrupt, however. The explanation of Step One continues: “Our admissions of personal powerlessness finally turn out to be the firm bedrock upon which happy and purposeful lives may be built” (21). While we do begin to build purposeful lives again, we must also recognize that our daily experience will continue to involve suffering and frustration. But that is the pattern of falling and rising that Jesus laid down throughout his whole life, from the most humble beginnings as a baby born in poverty, to his preaching and teaching, and to his trial and execution for a crime he did not commit. As Christians we are called to follow him in that pattern of life, that way of the cross. God, mercifully grant that we, imitating your lowliness and following Jesus in the way of the cross, may find these 12 Steps none other than the way of life and peace; through Jesus Christ our Lord. Amen. This entry was posted in 12 Steps of Christmas, Daily Office, Recovery and tagged AA, acceptance, bankruptcy, humility, Morning Prayer, powerlessness, Recovery, way of the cross on December 25, 2015 by Rodger Patience.